Zod, Mongul and the rest of the Revenge Squad inform Cyborg Superman that the time for talk is over and the time for action is now. The Cyborg tells them about the Fortress of Solitude and how it is the key not only to the destruction of Superman but everything the Cyborg promised to his compatriots. Meanwhile, at the Fortress, Jonathan Kent and Krypto look around at the artifacts stored there. A mysterious voice draws Jonathan's attention as Kelex informs Lois and Superman that he is unsure what is causing Superman's blindness. The villains arrive and begin their siege on the Fortress. Superman tells Jon to get Lois to safety and don't look back. Despite being blind Superman goes on the offensive but is quickly overwhelmed. 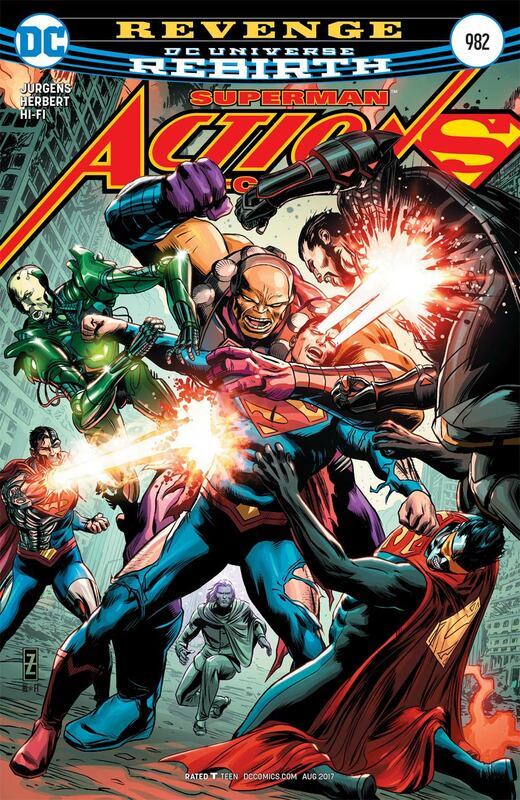 Suddenly he is taken from his enemies and Lex Luthor, Supergirl, Superwoman, Steel and Super-Man stand before the Revenge Squad with Lex declaring that the only way Cyborg and his forces will get to Superman is over their dead bodies. Story - 5: There was a lot to like about this issue. The scene at the beginning where Cyborg Superman laid out the reasons the group needed to invade the Fortress showed that while these characters are a team they don't have a whole lot of faith in each other. Henshaw is constantly having to give them reasons to do what they do and it gives Dan Jurgens a chance to play with these characters as characters instead of things to throw at Superman. The scene with Jon and Krypto in the Fortress didn't have much to do with the story itself but it did allow Jurgens to do a little world building. Writers attempted to do this during the New 52 but due to the game of musical chairs that DC seemed to be playing with the creative staff very little stuck around for more than a few months. With the exception of Hamilton County I haven't had those concerns in the Post Rebirth world. The siege on the Fortress had a good bit of malevolence to it. It reminded me a little of a similar scene in WHATEVER HAPPENED TO THE MAN OF TOMORROW and I loved how a group of mostly classic (and one new) Superman villains are trying to kill Superman at a classic setting. This felt like a true Superman story from beginning to end and Jurgens once again proves that many of the criticisms creators and fans have of Superman are mostly bunk. "He's too powerful," they say. Okay, increase the threat level so that he's facing not one of his strongest foes but a team of them. On top of that hobble him by making him blind. Right there you have an exciting and engaging story where Superman must rely on the help of some friends to get out of this one. That final page was the icing on the cake of this issue. Jurgens is using the entire Superman Family in this story and while some might argue that it makes Superman look weak I'd counter that with the face that it's awesome that he has a "family" to call on. While they didn't work together near as much as the Batman Family did, the idea of a "Team Superman" was a thing in the mid to late nineties and it was something I was quite fond of. I loved the idea that there were other heroes with an S on their chest doing their own thing but ready to team up when the threat demanded it. I'm still fine with Lex being in costume, which is something that would have driven me nuts a year or so back. REVENGE is shaping up to be a blockbuster summer movie of a story. That's not a pejorative. Jurgens isn't skimping on the character to give us page after page of beat downs. He's giving us that characterization on the fly and expanding on the world Superman lives. Art - 5: Jack Herbert (aided this time by Jose Luis and Ray McCarthy) continues to provide excellent art to this story. The Ordway influences were a little more pronounced this time out but it's not distracting. In fact, Superman and the other characters had a classic but modern feel to them. The action was intense and the page layouts were dynamic. The art continues to be just as amazing as the writing on this title. 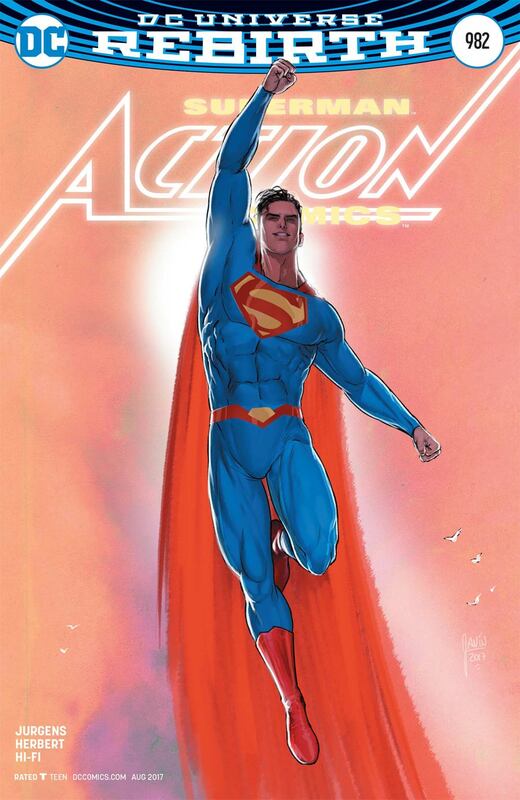 Cover Art - 5: This is another great battle cover with additional point for showing Superman's uniform torn and tattered. All of the villains look great and Superman really seems to be fighting for his life. Variant Cover Art - 5: I'm not as enamored of this cover as others seem to be but it is nice. Superman looks a tad young but it makes for a good variant image and I'm glad so many people seem to like it.